Join Indie Fight Club for the perfect mixed martial arts training. Whether you’re an expert or just a beginner, just looking for fun training, or for weight lost programs, this is the place for you. Indie Fight Club has real certified professional coaches and courses to guide you to reach your goal. Training in Indie Fight Camp is a journey for which to experience the warm and friendly local lifestyle and culture. It is a feeling of home away from home in paradise island of Bali. During this training, you will be staying in Indie Fight Club. It spreads over 4800 square meters and offers three different types of cozy and clean accommodation to choose from. Among the room, there is a private double bed en-suite with your own bathroom, a private double bed room with a shared bathroom, or a hostel bed, sharing with a maximum of six people per room. There will be two times daily training from 9 a.m. to 11 a.m. and 3 p.m. to 5 p.m. During this time, each two hours of the course training time varies for each specific activity from one person to another. Besides Muay Thai, Indie Fight Club also provides boxing course as well as Pencak silat, so guests can choose to do whichever they prefer. After all, these exercises are intended to help guest stay fit, lean and mean, and healthy. This training will be held in Bali, Indonesia. 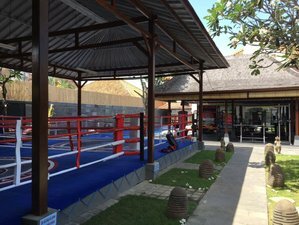 Indie Fight Camp is situated in Bali central upscale area between West Sanur and Denpasar. It is the first most complete full facility fight camp in Bali and is the biggest. There is a lap pool, leisure pool, Jacuzzi, personal lockers, spacious training, and fully equipped gym and cross fit area. Set in tranquil garden, with two back to back rings, three different types of cozy clean accommodation to choose from and an additional yoga classes and spa, as well as a healthy food café. It is all as part of the one stop facility to cater to your training needs. This training packages do not include meals. Please book your flight to arrive at Ngurah Rai International Airport (DPS). The retreat center is only a short taxi ride away from the airport. Indie Fight Club is a place to train, lose weight, and see Bali. The skilled professional staff will guide you through the fight club experience.